Taiwan has long been a prolific builder of commercial vessels, but in the leisure market only a few one-offs have made it to Australia. Morningstar, a new brand of trailer boat retailed locally by Searano Marine, might change things. The review boat, the Bay Rover 498R, is essentially a traditional runabout but executed with a lot more style than is traditional. As with many imports this one turned up without sun protection, but a locally made Bimini will be offered. Construction is in plate aluminium from Alcoa, large areas of which have been pressed – presumably by an enormously powerful machine. The compound curves of the coaming, in particular, look as though moulded in fibreglass. The topsides and upperworks have been painted to a high standard but, unfortunately, the gunwales are not protected by a rubbing strip. Yet, curiously, the rails – another wear area – were masked and left unpainted. Searano are investigating the option of fitting gunwale rubbers. The layout maximises cockpit space, leaving just a small foredeck for the anchorer to lean over and open the lidded anchor well. He is helped in this task by an opening centre section of windscreen, a recessed dash, and a step in case he actually wants to get on the foredeck. A beefy grab rail runs the perimeter of the screen. The locally sourced seats are far above typical runabout equipment: pedestal mounted bucket seats, with bolsters and a lot of comfort. The lesser favoured guests have the use of a folding padded bench at the transom. The general upmarket feel is aided by carpet throughout, including inside the unusually roomy side pockets. These pockets are within the thickness of the bulwarks that contain sufficient buoyancy to qualify the Morningstar as having level flotation. Outboard of the transom a pair of boarding platforms flank the motor. As well as their primary task these are tough enough to be useful motor protectors alongside jetties. The 498 can take up to 90hp but, based on its performance with 60, only thrill seekers would want that much power. This is an easily driven boat giving the impression of all the parts being in harmony. This was largely due to the hull’s rigidity and consequent quietness. And that was probably partly due to all the stiffness imparted by the extensive pressing of the hull plates. The builder was keen enough on protecting that metal to weld a doubling plate to the forward end of the keel. The sea was in too gentle a mood to tell us much about overall ride quality; looking at the underwater body when back on the trailer suggested near average for size. Deadrise is 12 degrees at the transom, sharpening forward; again, about average for size. 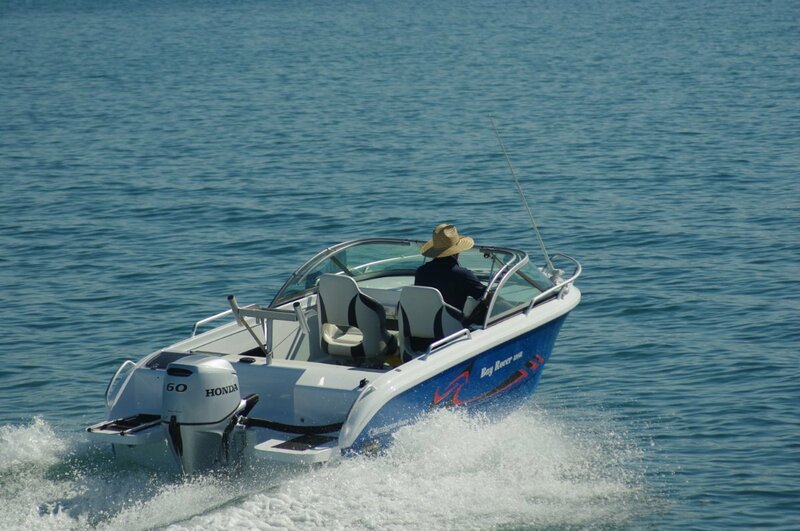 Like other runabouts the 498 will largely be used for fishing, and it is pretty well suited for the job. The swivelling main seats give premium class anglers’ perches, and those curved coamings are also backside friendly. Stability is above average for the boat size. The fishing fit out is as good as you could expect of a boat in this price range ($34,950 for boat, motor and trailer): transducer mount, large live tank, removable bait board and several rod sockets. Buy a sounder and an esky and you are in business.